This pleasant apartment is part of a beautiful agriturismo with a total of 8 apartments and 1 detached house. The apartment has authentic and cosy furnishings. Together with the other residents, you have access to a large swimming pool, private whirlpool and a lovely garden. 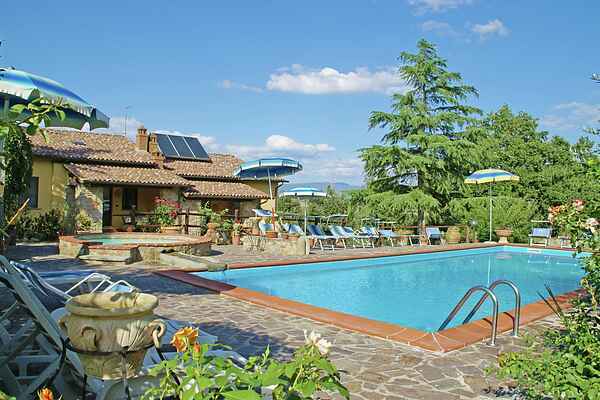 From the pool you have a beautiful view of the city of Cortona, 10 kilometres from your house. Due to its perfect location you have everything you need for a fantastic holiday close at hand. For example, you can get your daily groceries in beautiful Foiano at just 7 km. Near the house you can go on beautiful hiking and cycling trips along a small stream. The Etruscan city that you overlook, Cortona, is built against a hill in the middle of the Chianti valley. And 10 kilometres away you will find the beautiful medieval city of Castiglione Fiorentino. This is a walled town with a beautiful old city wall and it has small characteristic streets. Just outside the town you will find a beautiful medieval castle. The cities of Lucignano (10 km) and Siena (50 km) are well worth a visit. Besides a lot of history you can also enjoy shopping and relax in one of the many outdoor cafés. The agriturismo is located in the Tuscan hills in a quiet area. However, you can quickly reach all the highlights in the area. For example, at a distance of just 4 km, you can taste the famous 'Chianina Toscana' (Tuscan beef) in a homely restaurant. At 8 km is the Valdichiana Outlet Village with many (design) shops and ice cream parlors, bars and restaurants. About 12 km from here is the famous Etruscan town of Cortona.